"A good alternative to SVN and GIT"
Bazaar allows you to create a shared repository for develop code. It's interesting when there are lots of persons developing together. in general it fulfills its function, but it's a bit difficult to maintenance and administration, basically the permissions of the users and the rights with the different branches. But the main problem of bazaar, is that there are no releases since 2011!! "Yet another Version control system"
Git-like version control. Collaborating with others. I came from 'Git', CVS, SVN and perforce background. It took so much of time for me to understand the 'bazaar' concepts. I found it so confusing. May be because I didn't find many tutorials about bazaar. Also, none of the teams in our company use bazaar. I had to work on a project and was forced to work with bazaar since that project needed it. It's confusing. Branching is not easy to understand. I don't find any major advantages compared to a simple Git. Working on a Canonical related open source project. Had to use bazaar since that project needed it. I really wonder what benefits that project maintainers got by using bazaar instead of a simple and widely used git. Personally, I have not realized any benefits. "A simple version control system"
I wouldn't recommend anyone to use Bazaar, use git or mercurial instead as they are truly distributed and are the de-facto standards in the industry. Bazaar gives to the illusion of being distributed but it's like an improved version of SVN. 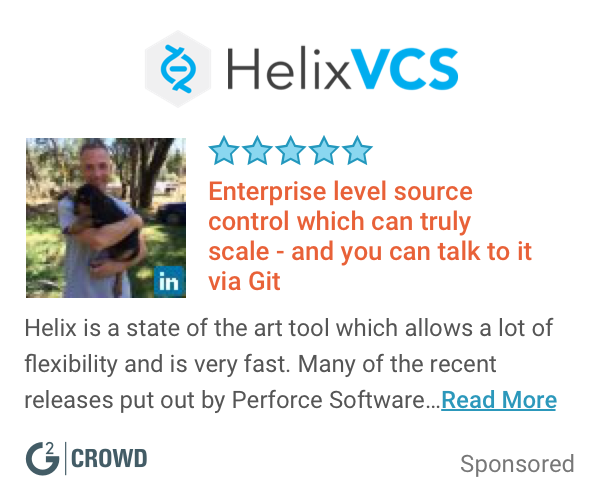 I used it because it was the VCS the company I worked at used, but they've migrated to git. Versioning our code and allowing developers to work in parallel without conflicting with each other changes. "Love Ubuntu GNU/Linux Community ? Learn Bazaar !" Support from Canonical, everything is clearly detailed. Also this Source control management tool is decentralized, like git, mercurial or others. this mean you can live and work outside a centralized server. It's not much used outside Ubuntu community, I don't really see any benefit to use it for my own, I'd rather use git which has an enormous user base and also supporting other tools. So I don't plan to invest more time on learning bzr but rather improve my git skills. Look at git/bzr backend it can be useful to use your favorite tool and change the backend to bazaar (or others). If you're looking for a host server, lunchpad,net comes to my mind first, but I think sourceforge.net is suporting GNU Bazaar. I tookover maintainance of a little ruby gtk utility which was already integrated into Ubuntu, Sources where relocated from private CVS repo to Bzr and hosted on Lunchpad. It had a great concept and the ideas sounded good. I cringed when I had to deal with projects that used bazaar. It suffered from a very poor implementation. Consider using git. Bazaar, from what I can tell is no longer developed or actively maintained. I was a lone developer/user. I wasn't working for a business, but when I compiled my own software, the projects that used bazaar always seemed to break often. The thing I disliked most about bazaar is that it was painful slow at cloning a repository. I appreciated git much more and even mercurial had a huge speed advantage to bazaar. Even relatively small repositories would take the better part of an hour to clone. A similar size repo in git would take only about a minute. It was a headache dealing with bazaar from day one. The other thing that kept me from recommending it to people was the fact that its community was very small and diminishing by the day. When emacs started to jump ship, I know this software was in trouble. * We monitor all Bazaar reviews to prevent fraudulent reviews and keep review quality high. We do not post reviews by company employees or direct competitors. Validated reviews require the user to submit a screenshot of the product containing their user ID, in order to verify a user is an actual user of the product. Hi there! Are you looking to implement a solution like Bazaar?